Our Minnesota State College of Business panel judged the CEO of publishing giant Coughlan Companies in Mankato as our 2016 Business Person of the Year. The 1800s were a century of great discovery, exploration, resourcefulness and achievement. Millions of immigrants arrived in America, drawn by the country’s promise of equality and freedom. While some settled in established cities along the East Coast, others braved untamed wilderness as they pushed farther west into states such as Wisconsin, Indiana—and Minnesota. Irish immigrant T.R. Coughlan was one of those pioneers, choosing Mankato as his new home. Working at first as a masonry foreman, he soon struck out on his own, starting Mankato Kasota Stone, one of the oldest family-owned quarries in the state. Limestone from those quarries can be found around the world, from the University of St. Thomas in St. Paul to the Shanghai Grand Theater in China. Over the decades, each generation of Coughlans expanded that legacy of entrepreneurship and innovation. In 1990, they bought and revitalized Capstone Press (now Capstone), creating Coughlan Companies as a holding company for it and other business ventures. Over the years, Coughlan Companies has grown to employ more than 400 employees and earn about $100 million in annual revenue. 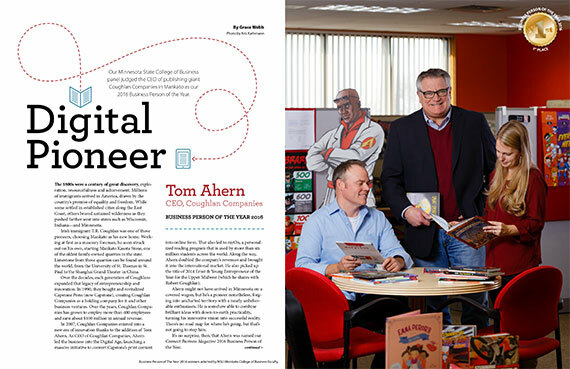 In 2007, Coughlan Companies entered into a new era of innovation thanks to the addition of Tom Ahern. As CEO of Coughlan Companies, Ahern led the business into the Digital Age, launching a massive initiative to convert Capstone’s print content into online form. That also led to myON, a personalized reading program that is used by more than six million students across the world. Along the way, Ahern doubled the company’s revenues and brought it into the international market. He also picked up the title of 2014 Ernst & Young Entrepreneur of the Year for the Upper Midwest (which he shares with Robert Coughlan). Ahern might not have arrived in Minnesota on a covered wagon, but he’s a pioneer nonetheless, forging into uncharted territory with a nearly unbelievable enthusiasm. He is somehow able to combine brilliant ideas with down-to-earth practicality, turning his innovative vision into successful reality. There’s no road map for where he’s going, but that’s not going to stop him. It’s no surprise, then, that Ahern was named our Connect Business Magazine 2016 Business Person of the Year. I’m from all over. I was born in Connecticut, but we moved shortly after I was born to Kansas City, Kansas and then to the area where I really grew up, northeastern Ohio. I’ve moved from one coast to the other and have been in Minnesota for 27 years now. What did you enjoy as a kid? I played every sport. My favorite was basketball, but unfortunately I was best at football. Throughout high school, I participated in baseball, track, basketball and football. I was also president of Student Council, involved in the yearbook committee and part of the chess club. As my father used to say, I was always going nine ways to Sunday. My very first paid job was as a busboy at a buffet for 85 cents an hour. It was a summer job, which I kept until football practice started. My parents didn’t ask me to work, but I wanted to start earning my own money. Another summer, I worked at a boat dock. Then I earned my advanced life saving certificate and became a lifeguard for the next three summers at Farmer Jims, a large recreation park with a man-made lake. It was the size of a football field, with the swim dock out where it was above everyone’s head, and the place was very dangerous. As the day wore on, we’d have 7,000 people at the park, and people would be drinking. Typically, it was guys who were going to be a problem. As they’d drink more, they’d convince their friends who weren’t good swimmers to go out and try to swim… and you knew they weren’t going to make it. They eventually had to shut the place down. Did you ever have to save anyone? I probably had about 12 saves a summer. I had a couple swimmers who were completely passed out at the bottom of the lake, that I had to find, swim down, pull in and resuscitate. But nobody died in the three years I was there. Did you ever have any close calls yourself? Oh, yeah… I had one guy who was completely panicked. I got him breathing on the way in to the shore area, and that’s when he freaked out. Unfortunately, the novice lifeguard, who had frozen on the save, didn’t clear the diving board either. So as I’m coming in to bring the guy in, somebody almost dove in on top of both of us. There were some close calls. I was young; I didn’t know any better. But you had to pay attention. There was always a save going on over the weekend. What subjects did you enjoy in school? I was probably not the most studious. Frankly, I was more interested in all the activities going on and got the grades I needed to get. In hindsight, I could have done a lot better if I’d applied myself. But I think that actually helped me later. I see some kids now, where they work so hard to get a job, and then they expect someone to give them something when they get to work. But really, once you get there, it’s time to work. I felt that I was mentally ready to dive in and apply myself. And I was fortunate that it was really probably football that got me out of that area, since I got a football scholarship to play at Northwestern University. At the time, Northwestern was the fifth most expensive college in the country. There was no way my parents were going to be able to afford that. So I knew not succeeding was not an option. How did your college team do? We lost a lot of games. My mother used to say, “Losing builds humility,” and I would reply, “Mom, I’ve got enough humility. I need a U-Haul to carry all this humility.” We would typically win one game a year. Football at Division 1 level was a year-round sport, so you’ve got winter workouts, spring ball, summer workout, fall season. It’s a full-time commitment, but by God, every year, we thought that next year we were going to the Rose Bowl. But you’ve got to have that kind of attitude to get you through a whole year of prep for a season that’s relatively short. What was it like to go to such a highly ranked college after not trying too hard in high school? I was ill-prepared. Many of those students came from private schools and boarding schools, so I had a lot of catch up to do when I got there. The interesting thing was, the athletic department did nothing to support your academics. I was recruited by a number of other colleges that promised, “We’ll take care of your classes.” But I remember thinking, “Well, what do I end up with? After four years, I haven’t gone to school. Do I even get a degree?” It wasn’t the path I wanted to go. At Northwestern, it was the opposite approach. They expected you to deal with the academics on your own. One example is how you had to take a pre-test for calculus to determine what level you were supposed to go in. I took the test, got into this level of calculus, and the first day the teacher asked, “How many of you have not had this level of calculus yet?” And of 55 students, I was literally the only one who raised my hand. I thought to myself, “Oh, I’ve made a mistake.” That was the best C I’d ever gotten. Did you have any jobs in college? NCAA rules were pretty strict on not having the student athletes have any kind of regular job, but a number of us did get hired as heavy security for the biggest rock and roll concerts in the Midwest. So we’d work at concerts featuring Led Zeppelin, the Stones, Tom Jones, The Who. I probably did 50 concerts. It was not fun, to be honest. I always thought of myself like a basketball player; I would want to manage the situation. Doing heavy security at rock and roll concerts, people are drunk or drugged up, and there are a lot of times that come up where you have to get physical. That’s not my makeup. Most of the time, I was able to calm things down. I took pride in being able to diffuse the situation and get people back to where they were supposed to be. Do you have any crazy stories from one of the concerts? I think the worst one was the first one I did. It was in the Pontiac Silver Dome with Led Zeppelin. There were 88,000 people attending on “festival seating,” where it’s first come, first served. I was one of three guys between the stage and the crowd, and they’d built a nine-foot barricade between the two. The problem was, the band was an hour and a half late, so people started pushing from the back of the field. There’d be waves of people coming and pushing and falling. They’d get up to the barricade and they were getting crushed. So we’d have to reach over and pull people up over the barricade. Some of them needed medical attention, though nobody died. Not only that, somebody threw an M-80 (firecracker) over, and it landed right next to my head and blew up. So I couldn’t hear very well for a while. It was just a terrible day. I think I made $37 on that one, and I remember thinking, “Is it worth it for all this?” But all that just builds character. You graduated in 1980.What came next? I had an opportunity to get a job in Minnesota at a big Fortune 100 company called Control Data. I worked in their Aerospace Division, where they created militarized versions of computer hardware and storage equipment that could fit on jet fighters, submarines and aircraft carriers. It was really cool. We’d get these contracts to provide F16s’ onboard equipment storage devices, and so it’d be a $10 million contract. My job was to take that contract and provide work orders for everybody, and I’d track all the costs against those work orders. It was a great first job because I worked with everyone: research, development, marketing, sales, product management. Everybody was in that one building, so I got to see how a whole company operated. I did that for about 18 months, and then I tried my hand at programming. A coworker and I started writing this program in Fortran 5 language to automate our spreadsheets. About a month into it, I got the realization that I probably was two or three thousand lines of code into an 400,000 line of code solution. And I said, “I don’t think this is for me.” I didn’t have that much patience. At the same time, somebody I respected told me to get into sales. At first, I didn’t think it was for me, since I’m not pushy. But he was very successful. He was in this whole new really creative area where the company was one of the first to look at applying technology and computers to education and training. That was one of 40 sales positions and channels that Control Data had. I looked at all 40 and said, “If I’m going to sell, I’ve got to sell something I can get passionate about.” I decided I didn’t want to sell a hard drive or a mainframe, but I got really intrigued by this new education business. And I decided I wanted to move to California. So I interviewed in L.A. and San Francisco, and I got the job in San Francisco. I worked with a division of Control Data called PLATO Learning. My bosses said, “You have part of the San Francisco bay area to call on anybody who wants to listen about how to apply computers to education and training.” I’d call on San Mateo Middle School or Wells Fargo, where they wanted to automate their teller training. But eventually you started running training centers instead. I actually sold the first Fairbreak training center for Control Data in California. This center was focused on serving the needs of socioeconomically disadvantaged youth. I got a training program funded in the east bay, to train 55 local youth into computer repair. We got that center up and running, and we placed 95 percent of young adults into high paying, long-term career jobs. That worked so well, I expanded that center, and over the years I ended up with 17 centers up and down the west coast. No one had done this before; I had to sell the idea, find the real estate, negotiate the real estate, hire the staff, train the staff, explain what the contract was, and do it several more times that year. There was no blueprint about how to get it done. You just figured it out. So they shut down that group and focused everything on implementing PLATO software into schools, and they asked me to be a regional manager. I managed the K-12 education group, eventually running almost all operations from San Francisco. In 1988, I was relocated back to Minnesota to run sales nationwide. PLATO Learning was sold shortly after to William Roach, founder of Edu Corp. How did that change affect you? That actually ended up being the best thing for me, since I wasn’t part of this big monolith that was struggling to figure stuff out. We were our own division in our own company. I helped drive PLATO Learning at the point of its acquisition from about $3 million to an IPO (initial public offering) several years later, and ultimately to more than $100 million in revenue, with a market cap of over $400 million. Things were really looking up for the company when you left in 2001. Why did you go? What did you do once you left PLATO? This was my “It’s a Wonderful Life” moment. I got asked to do due diligence on this emerging pre-revenue company, SwiftKnowledge. They had this really slick analytical way to help educators analyze student performance. They could pull data in from test scores, from their student information system, from their health and wellness records, etc. They couldn’t afford to pay me, so they paid in stock. We met with these two big investment groups and did the pitch and they came back and said, “We’ll fund it on one condition: You stay and run it.” So I stayed on a CEO. It was slow going at first, but we were able to take that company from pre-revenue to one of the Minnesota Best 50 Growth companies. As I was working on selling that company, Bob and Jim Coughlan’s search firm contacted me about the opportunity to be CEO of Capstone. They were looking for someone who had both an education and a digital background. I said sure, I’d meet them. They felt that I was a good fit, but the sale of the company kept delaying. I finally got to the point where I knew I couldn’t delay any more and I just had to leap. So I did that in July of 2007. I would go to work in the morning to my old job, to make sure everything was all right, and then I’d go after work many days to my old job too, to get them ready for the acquisition. It was supposed to happen 3-4 weeks after I left, but that blew up and the company didn’t get sold for another year. Some people like to take downtime between jobs, but there was no downtime here. You said Bob and Jim wanted you—but why did you want to work for them? I wanted to get back into the content side of education. The interesting thing for me was that they were purely in print at that stage of the company’s development. At the time, 90 percent of their publishing business, Capstone, was to school librarians. But they wanted to be in high growth mode. I thought they had great content, and I saw real innovation and passion in the company. The Coughlans had cemented that as a cornerstone of the culture and the DNA of the company: innovation, passion and customer service. It wasn’t just the librarian customer but the ultimate customer, the child. “What’s going to motivate and really move the needle with the child?” We can really try to make a difference here. For the first number of years in the company, they were focused on engaging struggling, reluctant boy readers. They had great innovation around how to present what might otherwise be, in other schoolbooks, really boring, whether it was science, social studies or math. When people thought of content that could really reach those struggling, reluctant boy readers, they thought of Capstone. Then it became those reluctant girl readers too, and then it broadened out to pre-K to middle school. How did you begin turning to the digital side of things? The good news was that the people that were responsible for developing content were wonderful, great, passionate and innovative. They got everything done on time and on budget. The customers were saying great things about our innovation and customer service. So I thought, “Don’t screw that up.” Instead, we looked at how to approach getting our content in front of kids. Kids aren’t necessarily in the library. What we saw was an opportunity to really evolve the content in a digital way, but at the same time we said, “Let’s protect the core.” I’ve seen a lot of companies chase the shiny object, and they forget what got them there. We took a lot of initially low-cost experimentation approaches towards digitization. First, we tried moving some books into interactive audo CDs. And then we put them up on the web. Next, we believed there was an opportunity to create an online research database. We explored the market and determined that there was nothing for low-level readers, pre-K through third grade. We came up with this database called PebbleGo, and it just took off. I think we had 1,000 trials in the first month that we announced it. Now we’ve added five more additional databases and moved up in grade levels. This year, we’re launching a Spanish version. Next, I looked at the print content we’d developed. If it’s older than three or four years, even though the content is still viable, within a printed book, a librarian’s looking for something that’s more modern. So all of a sudden we have this huge investment that we’ve made into thousands and thousands of books that’s no longer generating much revenue. What we decided to do was take a bold, digital view of all our assets, asking, “How can we recreate ourselves in a digital way?” We needed to create a new entity that was going to be freed up from the preexisting mindset of how content gets into books and books get to customers. The result was your Capstone Digital Initiative—and the extremely successful myON program. How’d you come up with that? Today, to meet the needs of our readers and customers, we offer both a physical and a digital experience for almost everything we create, but at the time, this kind of thinking was new for the company. To help us evolve rapidly, we built a new team with some of the most talented innovators and educators in the space. This team shaped the strategy to create a personalized reading platform for kids. We began a massive conversion effort and ultimately put thousands of books with audio read-alongs online. Working with a nationally recognized tool that measures reading levels, we were able to develop an appropriately leveled reading interest inventory for each reader and a customizable dashboard of books for every child. We called it myON. This is such a rich reading environment, and the child controls it. Each child can choose what to read, and that choice is a powerful motivator. Were you concerned about cannibalizing yourselves? I think we took this train of thought: If we’re going to be cannibalized, I’d rather be the one doing it. It might be a risk, but let’s go for it. We’re still selling print books to librarians, but we’ve gone from 100 percent of our business being on the printed side to more like 60 percent. By the end of 2016, we’ll probably be 50 percent digital subscription and 50 percent print. The total digital business will be almost as big or even bigger than our historical print business was. How many kids are using your myON program now? We have more than six million kids enrolled on the system. We probably have, in any one day, about 250,000 on the system, and about half of the registered kids engage every month. We have huge usage in the evenings and weekends and in the summer. We want to be wherever the kids are, so we work on IOS, Android, any web application. The critical stat for me, in terms of success, is the average session time. It’s proven that if you can get a kid to read for 20 minutes a day, you’re going to see marked improvement in their reading scores. And we’re averaging about 21 minutes a session. Kids are getting in and staying in. MyOn is also getting recognition globally. We’re in Turkey and Colombia and other countries. Those countries are looking for ways to immerse their students in real English. We don’t use synthetic voice. We actually pay professional actors to come in and read the books. Between myON, PebbleGo and our Capstone Interactive books, we reached about 55 million visits in 2015. How do you come up with new content? We have this great content engine—almost 100 people participate. They keep cranking out new stuff. They look at trends and how standards evolve, like with Common Core. We do licensing arrangements with Warner Bros., the Smithsonian Institution and other organizations. We recently released a whole series of science books featuring none other than Wile E. Coyote learning forces in motion, magnetism and things like that. You can imagine all the maladies that befall him. We’ve become known for a series called You Choose, which gives you alternating ways to go through a story and have different endings. So if you’re in the Titanic, and you hear the alarm, do you blow it off and stay in your room or go up to the deck? We probably have 100 books with You Choose. Now our team is starting to do things that are digital first and then create print books for them afterwards. That was a real watershed mark we had in 2015. A lot of change is going on with how we do our jobs, but underneath it all, it’s that passion and innovation and ingenuity that I know is the hallmark of the content that drives us. What challenges are facing Capstone at this time? We’ve had to weather some tough economic times. Schools aren’t funded very well. We are just now starting to get back to pre-2008 budgetary levels. I’d say the current levels of funding in schools makes for a tough growth environment. That’s a big issue. You have offices in Mankato, Minneapolis, Chicago and Oxford. The first three make sense, but why England? We made an acquisition of a company called Heinemann-Raintree from Pearson Education in 2008, and their offices were in Oxford. We saw that as a launching point to take our product into international markets. We probably have 30 some folks there. I think this company has really blossomed on a global scale. We’re looking at some other significant opportunities overseas, so we’ll see how those play out. Some industry experts say print is dying and everything will eventually be digital. Do you think that’s true? When I got here, everybody thought print was going away. I’ll never forget the first strategic plan I delivered to the board of directors. It included risks and opportunities. One risk was, “Are we scared enough?” Was print going to go away faster than we expected? But the other risk was, “Are we too scared?” I didn’t want to assume the sky was falling and see it be self-fulfilling. There’s definitely been a movement to digital, there’s no question. But I think the dramatic decline in print that many people would have predicted 6-7 years ago has not happened. You’re seeing it also on the trade side. EBook sales are starting to plateau. I also think, especially on our end, in children’s books, people like to have kids have that tactile book experience, especially for younger kids. But we’ve now successfully repositioned ourselves. Almost every printed book is also realeased as an interactive book and an eBook. At this junction, we’re format neutral. If the world wants to go to digital, they’ll still want to read our content. So it’s not really a factor for us. But we still have to listen to what they want and how they want it. What’s the future look like for Capstone? We have a third digital initiative that we’re piloting. Without revealing too much, the trend in education is a 1:1 device-to-student ratio, with many schools striving to have a device or computer for each student. They’re putting tablets into every child’s hands. What we’re finding, typically, in education is that they usually think hardware first, and then tackle, “Now what do you do with it?” We had all these smart boards that went into classrooms that a lot of times just became a glorified white board. We’re looking at ways we can help educators really lead personal instruction in a 1-to-1 environment. Meanwhile, serving the needs of schools that don’t take that 1:1 approach is just as important to us. So stay tuned. In our September issue, we asked readers to nominate area business leaders for our annual Business Person of the Year award, based on the criteria of business results, personal character, leadership, and community involvement. After receiving nominations, we gathered information on each nominee. Minnesota State College of Business professors then selected the top three nominees for inclusion in our January issue. When it comes to giving back to the community, Coughlan Companies is involved in more ways than you can count. There’s the Capstone Literacy Center, started in 2012 to offer free specialized instruction from trained tutors for struggling readers in grades 1-5. Many of the volunteers come from the company’s employee base. Continuing with the literacy theme, Capstone donates thousands of books a year to different causes and locations. Every child in Blue Earth County receives one book a year from birth to when they go to school, while Capstone teams up with the Southern Minnesota Initiative Foundation to donate thousands more books across the southern Minnesota region. Capstone has also sent books to victims of the 2013 tornados in Oklahoma and students in Africa (sending 300,000 books in 2010 alone), to name a few. Starting in 2010, team members have begun volunteering in Cuna Maya, Mexico. It started at the company’s annual sales meeting in Cancun, when some of the employees suggested volunteering at a mission in the jungle they supported. In the annual trips since then, the group built mini-libraries throughout the village for the residents to use. Now the plan is to wire the entire community to provide internet access, iPads and online educational content. “We’re trying to give the kids access to the world,” Ahern said. Ahern has nothing but good things to say about working with the Coughlan family. Ahern added that working at Coughlan Companies is much different than his old jobs, where he either had to answer to thousands of shareholders (as a public company) or to a large group of angel investors. For him, one of the best parts of being part of Coughlan is the company’s focus on the future. While the Coughlans might be focusing most of their attention on the publishing industry right now, the family business actually started in the stone industry. Founded in 1885, Mankato Kasota Stone was a fixture in the Mankato community for more than 135 years, providing high quality dolomitic limestone in unique yellow-pink color variations. Mankato Kasota Stone made the news in 2013 when the Coughlans announced they were suspending operations because of a loss of construction projects due to the recession. More than two dozen employees were laid off as a result, though many were transitioned into Capstone and Jordan Sands. Ahern said Mankato Kasota Stone has suspended operations in the past when the economy warranted it. He added that the plan is to focus on Capstone and Jordan Sands for the time being. According to Ahern, the company may resume operations if and when the Coughlans feel it makes sense. “I think we’ll let the market tell us when it’s time to start up operations again,” he said. As the demand for silica sand increased because of the expansion of domestic oil and gas production, the Coughlans moved forward with their plans to mine about 70 acres of their old quarries, starting in Jefferson Quarry, and use another 40 acres for sand processing. It took three years for the somewhat controversial project to obtain all the proper permits, but the project was finally approved in August 2013, with operations starting in spring of 2014. The operation includes the mining site, a wet plant to wash the sand, a dry plant where the sand is dried and sized for different uses, and a rail-loading site. While local residents raised concerns about the impact of sand mining on the Mankato area, Ahern said the company has gone above and beyond to ensure environmental protection. To ensure that the operation was safe, the company volunteered to do ambient air-monitoring at the plant and mining sites where the air is sampled every six days. This data is provided to the state of Minnesota and Lime Township on a regular basis. The company also agreed to keep trucks off the road during the busy morning commute time, and it has a robust fugitive dust program in place. While Ahern said the state-of-the-art operation is even more efficient than they planned, Jordan Sands was hit by a curveball in late 2014 when global oil prices dropped to nearly record levels. The business was able to save substantial money on transportation since it sits right on the Union Pacific Railroad, but it has still been a tight economy in recent months. Jordan Sands extracts about half a million tons of sand a year, sending most of its product to Texas. About a fourth of the sand is used to make glass bottles. The company has obtained permits for about 15 years of mining, but Ahern said the plan is to continue operations long after that.